3 − = two Required Please enter the correct value. The Snapchat IPO could debut as early as Q1 2017, which is why we wanted to make sure our readers received our latest Snapchat stock recommendation before the IPO date. Snapchat could have a massive valuation, between $25 billion and $40 billion. And because of that massive valuation, the Snapchat IPO could be the most-hyped IPO of 2017. But just because the Snapchat IPO has a lot of hype, that doesn't mean it's a good investment. Today, we're going to share our recommendation for how to play Snapchat stock ahead of the IPO. Snapchat is a social media app that allows users to send photo and video messages. Users can add animations and doodles to these messages, and the messages will disappear after several seconds once they are viewed. Snapchat has a strong following among teens and millennials. According to Bloomberg, 70% of 18- to 24-year-old Americans with smartphones use the app. In June 2013, only 6% of 25- to 34-year-olds used Snapchat. By June 2016, 41% of 25- to 34-year-olds used Snapchat. That's an increase of 41% in three years. Snapchat's "Sponsored Lenses" were launched in 2015. They allow users to take a picture or video with different filters that are paid for by an advertiser. These lenses can cost up to $750,000, and big companies are signing up to use them in campaigns. For example, 20th Century Fox used lenses to promote "The Peanuts Movie." Lenses will generate $102 million in revenue in 2016, according to eMarketer. Snapchat also allows companies to buy advertising space. Revenue from video ads on Snapchat is projected to reach $250 million for 2016. Finally, Snapchat also has a new physical product for sale. "Snapchat Spectacles" are a pair of sunglasses that can record up to 10 seconds of video. The video can be posted directly to Snapchat wirelessly. These unique glasses retail for $129.99 but are only available in vending machines in limited locations right now. How Much Is Snapchat Worth? Snapchat had a valuation of $25 billion at the beginning of 2016. 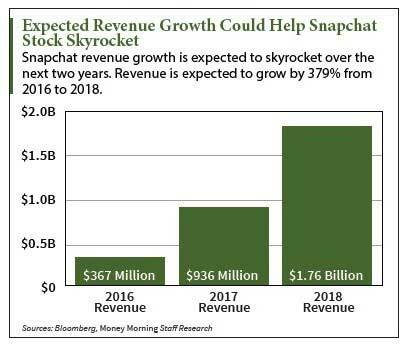 However, that could climb as high as $40 billion by the time of the Snapchat IPO. In 2015, Snapchat generated just $60 million in revenue. That total is expected to climb to $367 million in 2016, which would be a year-over-year increase of 511%. Snapchat is expected to generate between $936 million to $1 billion in 2017. By 2018, Snapchat could generate close to $2 billion. But does skyrocketing revenue alone make Snapchat stock worth owning? Should I Buy Snapchat Stock? 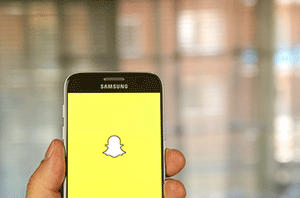 Money Morning Chief Investment Strategist Keith Fitz-Gerald warns that Snapchat could be one of the most dangerous IPOs in history. "Silicon Valley's hype machine has gone into overdrive in recent years and successfully convinced millions of investors that the only way they'll make a killing is to be on board or they'll miss out," Fitz-Gerald said on Nov. 21. You see, IPOs are set up for wealthy investors to make the most money. That's because wealthy investors and large institutions are able to invest in an IPO before retail investors. For example, Twilio Inc. (NYSE: TWLO) sold shares to wealthy investors for $15 per share before TWLO stock was available to the public. When TWLO stock was available to the public on June 23, it opened for $23.99 per share. That means those wealthy investors made a profit of 59% in the first minutes of trading. "Millions of 'mom and pop' investors are itching to get a piece of the action believing that they're going to make a fortune when getting burned is far more likely," Fitz-Gerald said. Investors should also be cautious about investing in Snapchat stock because tech stocks are volatile after IPOs. After opening at $30.40 per share on June 18, 2015, shares of Fitbit Inc. (NYSE: FIT) stock are now down 74% since its IPO. Shares of GoPro Inc. (Nasdaq: GPRO), which began trading on June 26, 2014, are now down 67%. Fitz-Gerald says there's only one way to play the Snapchat IPO, and that's as a speculative investment. Because this could be one of the biggest IPOs in 2017, we know investors still have a lot of questions. That's why we made this guide for our readers that covers everything you need to know about the Snapchat IPO.